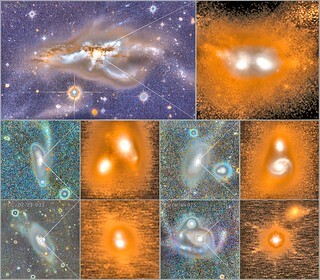 Original caption: Some of the Hubble Space Telescope's most stunning images reveal galaxies in distress. Many of them are in the throes of a gravitational encounter with another galaxy. The photos show perfect pinwheel patterns stretched and pulled into irregular shapes. Streamers of gas and dust flow from galaxies into space. And in this chaos, batches of young, blue stars glow like tree lights, fueled by the dust and gas kicked up by the galactic encounter. For some galaxies, the powerful meeting with a passing galaxy will eventually end in mergers.